Take the subway and transfer to a bus bound for Moerenuma Park. Tickets for connections with buses are available at subway stations. kyoiku dai ekimae, Nakanuma shogakko dori. Get off at Moere koen higashiguchi. Nakanuma shogakko dori. Get off at Moere koen higashiguchi. Nakanuma shogakko dori via Kanjodori higashi Subway Sta. Get off at Moere koen nishiguchi (west entrance). ・Take the Higashi 76 bus of the Chuo Bus Co.
bound for Nakanuma shogakko dori. snowy season (late December to early April). All buses running for a limited season stop at Moerenuma koen. Please note that each bus runs for different period. ・Take the Higashi 79 nonstop bus of the Chuo Bus Co.
of the Chuo Bus Co. bound for Moerenuma koen. July 19 and August 17, 2014. ・Take the Higashi 6 bus of the Chuo Bus Co.
From the Asabu Subway Sta. 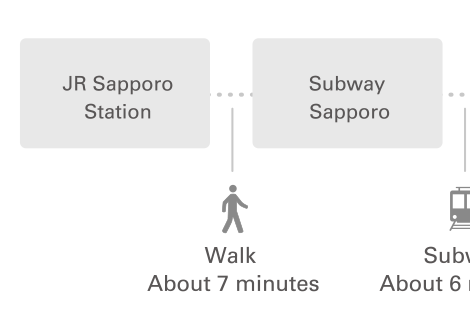 (Namboku Line) or the Sakae machi Subway Sta. 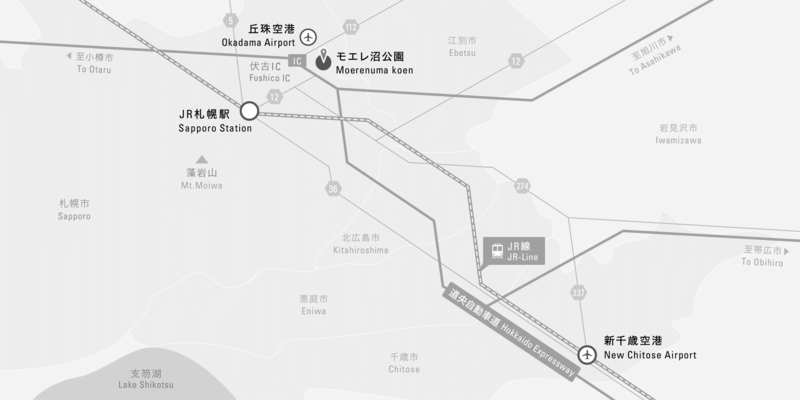 (Toho Line) to Moerenuma Park. Travel time: about 40 min. and 30 min., respectively. 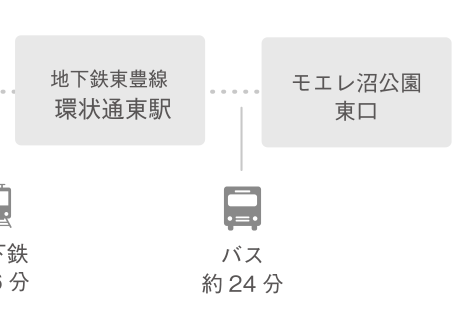 ・Take the Asa 26 bus of the Chuo Bus Co.
Take Nat'l Highway 12, Nat'l Highway 275 and Pref. Highway 89 (Kanjyo dori). Then, take Sankakuten dori Street in the direction of Nakanuma.Travel time: about 30 min. The entrance from Moerenuma park east exit,the hotel's glass pyramid Please use the center parking lot. 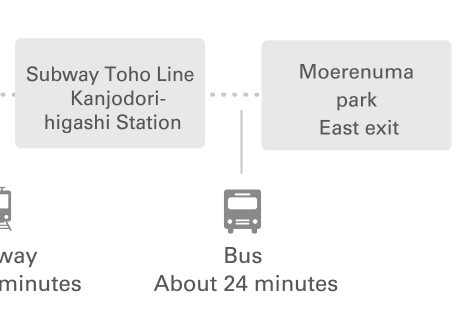 Take the subway and transfer to a bus bound for Moerenuma Park. Tickets for connections with buses are available at subway stations. From the Kanjodori higashi Subway Sta. 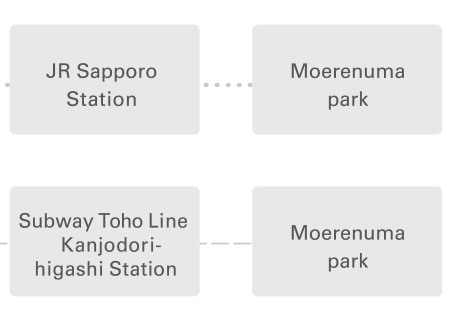 (Toho Line) to Moerenuma Park. ・ Take the Higashi 79 bus of the Chuo Bus Co. bound for Nakanuma shogakko dori. Get off at Moere koen higashiguchi. ・Take the Higashi 76 bus of the Chuo Bus Co. bound for Nakanuma shogakko dori. during the snowy season (late December to early April). All buses running for a limited season stop at Moerenuma koen. Please note that each bus runs for different period. ・ Take the Higashi 79 nonstop bus of the Chuo Bus Co. bound for Moerenuma Park. ・ From the Sapporo Beer Museum, take the Higashi 68 bus of the Chuo Bus Co.
From the Bus Center or JR Naebo Sta. to Moerenuma Park. November 30, 2014, and it runs every day between July 19 and August 17, 2014. November 30, 2014, and it runs every day between July 19 and August 177, 2014. Take Nat'l Highway 12, Nat'l Highway 275 and Pref. Highway 89 (Kanjyo dori). Then, take Sankakuten dori Street in the direction of Nakanuma. Travel time: about 30 min. the hotel's glass pyramid Please use the center parking lot. 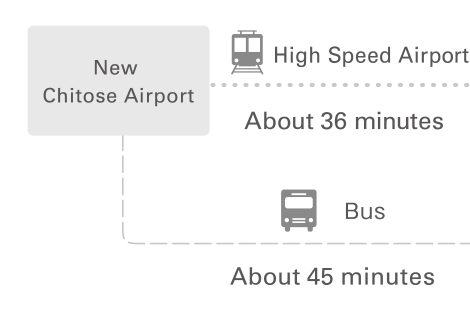 JR trains "Rapid Airport Express" travel between New Chitose Airport and JR Sapporo Station. Travel time: about 36 min. 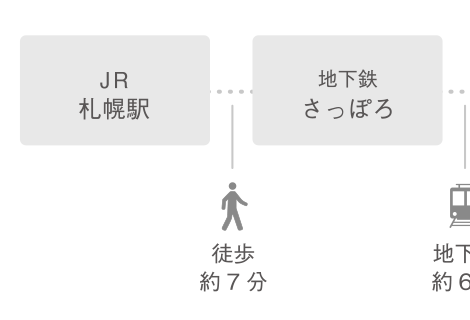 Fare: 1070 yen for adults, 530 yen for children. Highway express buses depart from New Chitose Airport for downtown Sapporo. Take a highway express bus bound for Higashi kuyakusho mae Subway Sta. (Toho Line). Get off at Kanjo dori higashi Subway Sta. and transfer to a local bus. Travel time: about 45 min. for Kanjo dori higashi Subway Sta. 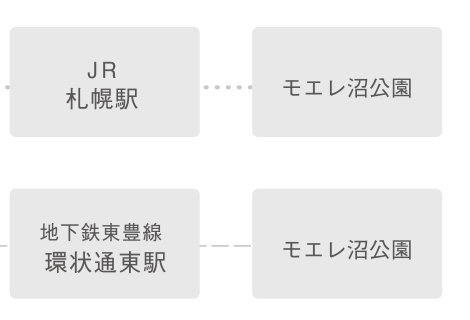 Fare: 1030 yen for adults, 520 yen for children. please see "1. Access from Sapporo." Take Pref. Highway 112 (Sapporo Tobetsu-sen Fushiko Takuhoku dori) from Fushiko IC for Ainosato. JR Sapporo Station. Travel time: about 36 min. 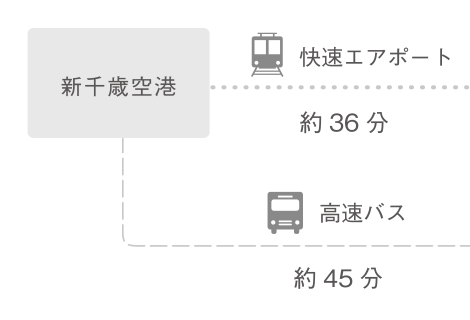 Fare: 1070 yen for adults, 530 yen for children. Take Okadamakuko dori Street in the direction of Kariki. Turn onto Sankakuten dori Street and drive in the direction of Nakanuma. Travel time: about 20 min. Take Okadamakuko dori Street in the direction of Kariki. Turn onto Sankakuten dori Street and drive in the direction of Nakanuma. Travel time: about 20 min. © 2014 L'enfant qui reve All rights reserved. © L'enfant qui reve All rights reserved.